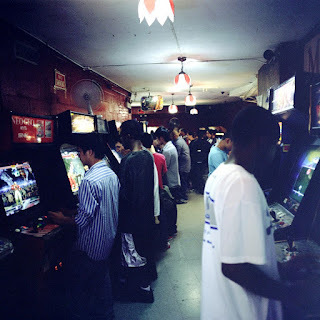 Written and produced by New York City based artist and filmmaker Irene Chin and directed by Brooklyn filmmaker Kurt Vincent, The Lost Arcade is an intimate story of a once-ubiquitous cultural phenomenon on the edge of extinction, especially in New York City, which once had video arcades by the dozen. These arcades were as much social hubs to meet up and hang out as they were public arenas for gamers to demonstrate their skills. But by 2011, only a handful remained, most of them corporate affairs, leaving the legendary Chinatown Fair on Mott Street as the last hold-out of old-school arcade culture. Opened in the early 1940’s, Chinatown Fair, famous for its dancing and tic tac toe playing chickens, survived turf wars between rival gangs, increases in rent, and the rise of the home gaming system to become an institution and haven for kids from all five boroughs. A documentary portrait of the Chinatown Fair and its denizens, The Lost Arcade is a eulogy for and a celebration of the arcade gaming community, tenacity, and Dance Dance Revolutionary spirit. Director Kurt Vincent said "I wanted to create a film that would capture the spirit that hit me the first time I walked through those doors. There was a melting pot of a community that congregated there, where all walks of life came together and shared one common interest: video games. It was a microcosm of what New York was all about. Not the overpriced New York we've come to accept, but what this city originally stood for and still does when you look deep enough. The Lost Arcade is about staying up all night with your friends in a hot, loud, dirty and packed arcade, having fun and feeling safe. It had its own language, its own quirks, these vibes that attracted like-minded kids to a place that may have been a safe haven even from their own home. You talk to these patrons, and they just want to share their stories and history of the Chinatown Fair to keep it alive." The Lost Arcade documentary opens in San Fransisco on 5th August and theatrically in New York on 12th. It's coming out on VOD in September and we'll have a review for you soon.